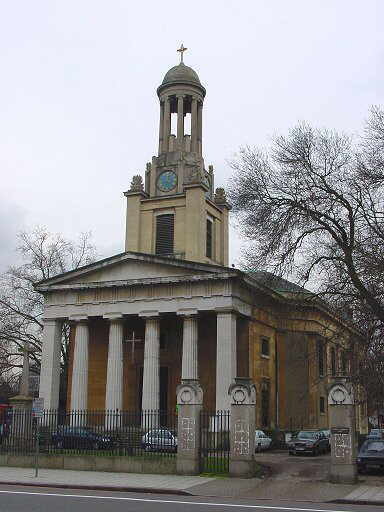 St Mark’s Church was the second of the four Commissioners’ or “Waterloo” churches built in Lambeth by the Commissioners for Building New Churches. The others being St Matthew’s (Brixton), St Luke’s (Norwood) and St John’s (Waterloo). Due to financial constraints (in total only £64,000 was allocated for all four churches) the Duchy of Cornwall was approached to sell part of Kennington Common. (It was the part of the common known as Gallows Common as several executions had taken place there.) However the Duchy did not have the power to sell common land so a special act of Parliament had to be passed to let the Church acquire it. This did not stop the building being started on 1 July 1822 and in the end the Royal Assent was only granted on 24 June 1824 six days before the Archbishop of Canterbury consecrated the building on 30th June! The Lambeth Vestry (the forerunner to the local council) received £484.6s.3d (£484.32p) in compensation for the loss of the common rights. Part of this money was used for fencing, marking, draining and improving the rest of the common, part was given to the Trustees of Kennington Schools and part used for Lamp posts/pillars in the Church Yard. The Architect was D.R Roper, although A.B. Clayton may have “ghosted” for him, and the builders were Messrs Moore, Grimsdell and Davis. Ropers’ design was for a building of “The Grecian Doric Order …. With Portico, and Tower, terminated with a Cupola of the Grecian Ionic Order” and cost £16,093.4s3d (£16093.21p). About half the cost £8442.2s.6d (£8442.12p) being raised locally and the balance being paid by the Commissioners. The building could accommodate over two thousand people. 1082 pew seats were rented out and the surplus over the ministers stipend (salary) was used to build a parsonage house. In 1898 a fine late 19th century carved oak pulpit was installed which came from the demolished St Michaels’ Church in Wood Street EC2. In the same year the brass lectern was presented by Charlotte Darlington and in 1903 the vicar John Darlington gave eight tubular bells. There is also a link to an account published in the South London Press of the dedication in October 1916 of a temporary war shrine to the dead and missing outside the church. British Pathe news has 1927 film of tramworkers arriving at the church to dedicate a stained glass window to their colleagues who died in WW1. 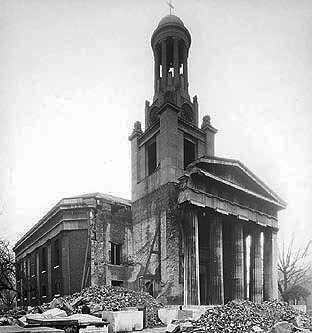 Like many other churches St Mark’s was badly damaged in September 1940 by enemy action and was partially restored in 1949. The stained glass window in south side of the church was made in 1952 by Barton, Kinder and Alderson and is of ‘St John baptising Our Lord’ to a design by W.T.C Shapland. It was a donation in memory of John Arnoldi Cotton and wife. Along the south side of the churchyard once ran a small stream, which was crossed by a bridge, called Merton Bridge, so named because the land had been bequeathed to the Canons of Merton Abbey who were responsible for its repair. Recently a thriving Saturday farmer’s market has been established in the churchyard.